Pasture-Based Operations: Could Part of My Operation Be an AFO? A pasture-based operation is generally not required to obtain an NPDES permit. However, if the operation includes a confinement area, this part of the operation may be considered an Animal Feeding Operation (AFO). Discharges to surface or ground waters from the confinement area could trigger designation as a CAFO. Washington has no specific requirements for non-dairy AFOs beyond no discharges to surface or ground water. This fact sheet explains the conditions under which an operation would be considered an AFO. To avoid the possible need for a CAFO permit, pasture-based operations should manage facilities and feeding areas to reduce the likelihood of being considered an AFO and to prevent discharges to surface or ground waters. 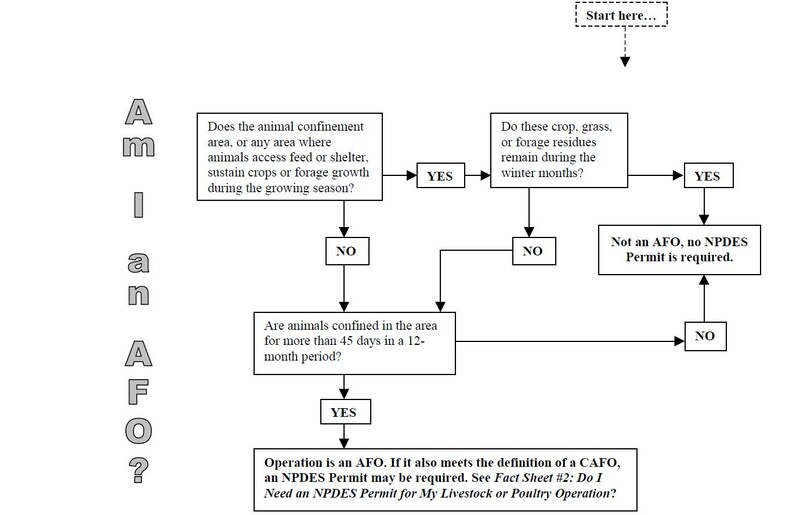 Operations that pasture cattle in crop fields or grass pasture must first be defined as an AFO before they can be considered a Concentrated Animal Feeding Operation (CAFO). If livestock are kept and fed in a field that does not annually sustain crops, vegetation, or forage growth, or contain post-harvest residues, this area would be considered “confined.” If the animals were confined for more than 45 days in a 12- month period, the operation would be an AFO. If the AFO discharges to surface or ground waters, it could be considered a CAFO. Neither EPA nor Washington State intends to require pasture-based livestock operations to apply for NPDES permits. However, if conditions in the confinement area meet the CAFO definition and the facility does not correct the problem in a reasonable period of time, then a permit may be required. Portions of many pasture-based and winter feeding operations will fit the definition of an AFO. These may include horse corrals, calving and weaning corrals, nursery/hospital corrals, bull pens, holding/working pens, etc. Many of these are a necessary component of the operation and cannot be eliminated. However, to reduce the risk of becoming a CAFO, the AFO should strive to eliminate the potential for a discharge from heavy-use areas. This fact sheet reflects the best professional judgment of the contributing author and is based on information available as of the publication date. Also, your state may have additional, more stringent requirements than EPA’s requirements. Con- tact your permitting authority for complete information on the regulations that apply to you. Copyright © 2003. MidWest Plan Service, Iowa State University, Ames, Iowa 50011-3080. Reprinted from Livestock and Poultry Environmental Steward- ship curriculum, fact sheet authored by Chris Henry, University of Nebraska-Lincoln, courtesy of MidWest Plan Service, Iowa State University, Ames, Iowa, 50011-3080 and your land-grant universities, Copyright © 2003. By implementing appropriate BMPs an AFO will help reduce the impact to water quality from winter feeding areas, pasture, and range. As long as the appropriate BMPs are being implemented, especially within the confinement areas, and there is not a discharge to surface or ground water, a CAFO permit is not required. Operations that implement BMPs to protect riparian health can significantly reduce impacts from polluted run-off (this may include moving heavy-use areas away from surface water). A pasture-based operation, where animals wander freely to and from areas for food and shelter, is not considered an AFO. Neither is a vegetated pasture where the feeding or watering areas are devoid of vegetation. However, some pasture- and grazing – based operations may have confinement areas that qualify as an AFO. Incidental vegetation, such as weeds, in a clear area of confinement, such as a feedlot or pen, would not exclude an operation from meeting the definition of an AFO. In the case of a winter-feeding situation, the “no vegetation” criteria in the AFO definition is to be evaluated during the winter. Therefore, use of a winter feeding area to grow crops or other vegetation during periods of the year when animals are not present would not exclude the area from meeting the definition of an AFO, if animals are confined in the area for more than 45 days in a 12-month period. Conversely, a feeding area in a pasture that does not confine the animals (i.e., gate is open) and allows free access to rangeland or pasture would not qualify as a confined feeding area and would not be consider- ed an AFO, regardless of the surface condition of the lot. However, the responsibility remains to protect surface and ground water from such an operation. Use the following decision process to identify if your pasture or grazing operation could require a permit. This decision process is shown graphically on page 3. Step 1. Is any field where animals spend time devoid of vegetation? If the field is not cropped or maintains vegetation, this area may be considered a confined feeding area. Step 2. Are animals confined for more than 45 days during any 12-month period? If livestock are not kept in the confined area for more than 45 days, they would not be considered an AFO. Confinement of more than 45 days would define the operation as an AFO. For the purposes of this determination, any part of a day counts as a whole day. To avoid meeting the definition of an AFO, you will need to manage facilities so that they are considered pasture-based operations. This management may require keeping things mobile, such as hospital facilities, working chutes and penning, and feeding facilities or utilizing these areas for less than 45 days during any 12-month period. Do not allow animals to destroy the vegetation in an area that could be con- sidered a confinement. Keep gates open and allow free access to pastures and rangeland. Allow animals to completely destroy vegetation in a lot or confined area that could be considered a confinement. Eliminate any discharges to water from the confinement area. rangeland and limiting the amount of time that live- stock spend in confined areas. Mitigating impact to surface waters and maintaining vegetation in con- fined areas is key to being excluded from the CAFO regulations. AFO–Animal Feeding Operation. This can be either livestock or poultry. CAFO–Concentrated Animal Feeding Operation. An AFO that meets the definition of a CAFO must apply for an NPDES permit. NPDES–National Pollutant Discharge Elimination System. The permit program that regulates CAFOs. Chris Henry, an Extension Engineer at the University of Nebraska-Lincoln, can be reached at chenry1@unl.edu. The author wishes to thank Ralph Summers, EPA Region 7; Gary Buttermore and Alan Rosenboom, Nebraska Department of Environmental Quality; and Claudia Elkins, Kansas Department of Health and Environment, for their review of this fact sheet. To obtain more information about the Farm Bill 2002, see the USDA-NRCS website at http://www.nrcs.usda.gov/programs/farmbill/2002/. You can also contact your local USDA Service Center, listed in the phone book under “U.S. Department of Agriculture,” or your local conservation district.